It is a long time ago since I painted in oil. This is my newest painting and I really need some time to become familiar with the oils again.This purple tulip painting in oil is painted on panel and size is 7,2 x 10 inch (18×24 cm). It is still not signed, but will do it as soon as the painting is dry. It is hard to get the right colours with the camera, but I think it is very close to the original. 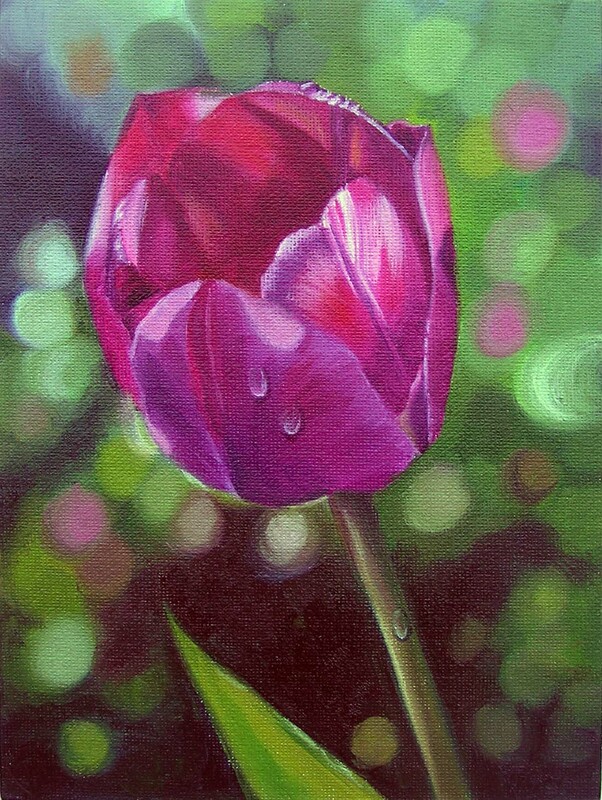 I enjoy painting flowers and this purple tulip painting in oil was growing in my own garden. I am always amazed to see my own flowers blooming. I am working currently on a pink Rose in oil in size 16×16 inch (40×40 cm) and I needed to re- paint some areas a few times. It still isn’t finished and I hope I can show it very soon. There are two other beautiful roses planned and I hope they will turn out in these paintings what I am hoping for.